The Deep Roots Music Festival Volunteer Appreciation Night venue has changed. All other details, as provided by your team leader, are the same but now, it all happens at the Louis Millet Center in New Minas. We will share cheer with a background of amazing local, live music to celebrate the ongoing success of DRMC and the Deep Roots Music Festival. Success that has been as a direct result of the dedicated DRMC volunteers. For planning purposes please let your Committee Chair know if you will be able to join us. 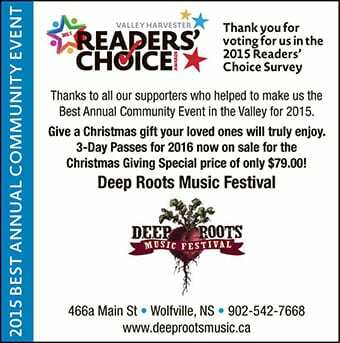 Deep Roots Music Festival voted Best Annual Community Event! All those who voted to make this award happen can’t be wrong! Deep Roots Music Festival…2015 best annual community event. If you love live music and all the vibes that are part of that kind of event, you can’t go wrong by wanting to share that gift of music…especially when it is part of a well established, 12 years and counting, festival. Check out last year’s festival line up or dig even deeper into the archives and you know the 2016 Deep Roots Music Festival is going to be good. Lots of behind the scenes work going on right now to make sure of that! Another successful Festival weekend goes down in the books! What an amazing Festival weekend … sold out shows, sunny warm days, great vibes all around town … smiles everywhere all weekend! A BIG THANK YOU to everyone who contributed in some way to making this year’s Deep Roots Music Festival such a success. The Festival just couldn’t have happened without all the support received from donors, sponsors, and volunteers. Not to mention all the great musicians and festival supporters filling the chairs and dancing up a storm each night. We’ll post some pictures real soon. And in the meantime, don’t forget to make note of the date for next year’s festival (always the last full weekend in September) … September 23, 24, 25, 2016. 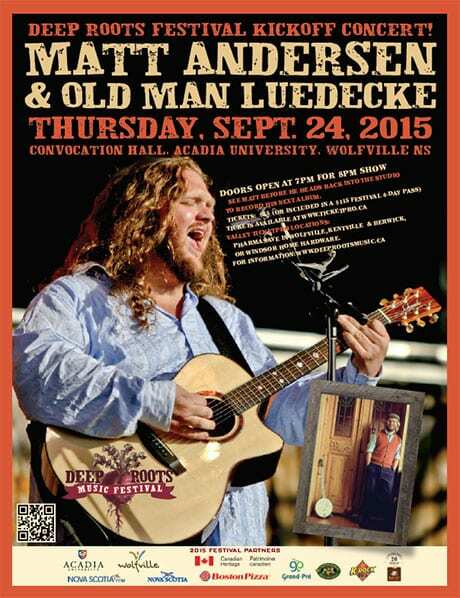 The Kick Off Concert Thursday night, Matt Andersen and Old Man Luedueke, is going to be hot! Have a listen to this interview Matt Andersen did recently with Blaine Morrison and then get those tickets if you haven’t done that yet. You may want to see this show more than once, particularly if you know anything about the internationally famous and beloved French cabaret singer, Edith Piaf. Ariana’s compelling rendition is worth experiencing! Two more concerts to add to your musical itinerary leading up to and during this year’s Deep Roots Music Festival. 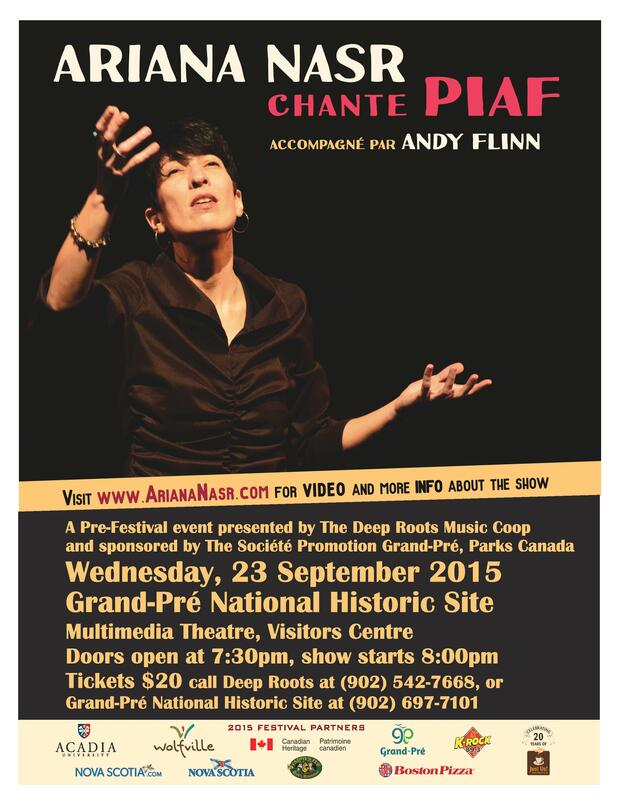 September 23rd, 8pm – a pre-festival concert featuring Ariana and Andy doing their “Ariana chante Piaf” show. Tickets $20.00; call either the Grand Pre National Historic Site, Grand Pre, 902-697-7101, or the Deep Roots Office, 902-542-7668, for information or tickets. September 26th, 8pm – Terry Kelly will do a show in the Celtic Hall at Paddy’s Kentville (42 Aberdeen Street, Kentville) with Shannon Quinn opening. Tickets – $25.00 plus tax, no refunds. Call Paddy’s at 902-678-3199 for tickets or call the Deep Roots Office, 902-542-7668, for more information. 2015 Festival Schedule Finalized – Program Booklet and Schedule online now! 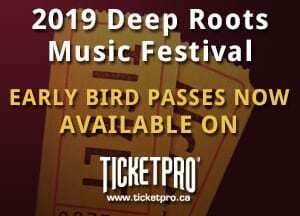 You can now check out the festival schedule and get a great taste of the delights we have in store for you at this year’s Deep Roots Music Festival! Gary Dunfield and his team at Gaspereau Press, who will soon have our booklet and schedule in print. Thank you to all of you for making Deep Roots look so good! $120 – minimum 5, maximum 12 participants per class – Three classes to choose from. Sessions are 12:30 PM – 3:00 PM each day with ‘Slow Jams’ from 4 till 6. A very exciting new event being held in conjunction with the Deep Roots Music Festival this year.. whether you are a beginner or a more experienced musician, if you want to invigorate your musical life, this camp is for you! A choice of workshops, working with seasoned pros, making connections within a unique creative community … click here for all the details, or check out our Facebook page. SEE MATT BEFORE HE HEADS BACK INTO THE STUDIO TO RECORD HIS NEXT ALBUM. PHARMASAVE IN WOLFVILLE, KENTVILLE & BERWICK, OR WINDSOR HOME HARDWARE.